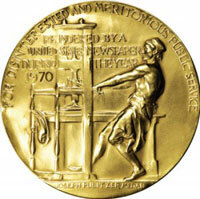 Online news organisations have for the first time won coveted Pulitzer Prizes, the top awards in US journalism. A journalist writing in a collaboration between online news service ProPublica and the New York Times magazine won an award for investigative reporting. Meanwhile, Mark Fiore of the San Francisco Chronicle's website won the award for editorial cartooning. Pulitzer Prizes are awarded annually by Colombia University to honour the best in US literature, journalism and music, BBC News reports. Anthony Shadid won his second Pulitzer in international reporting for his work with the Washington Post for coverage of the Iraq war. Shadid now works for the New York Times. Gene Weingarten of the Post won the feature-writing award for his story of parents who have accidentally killed their children by leaving them in cars. The Post's Kathleen Parker won for commentary and Sarah Kaufman won for criticism. The newspaper won more than any other publication this year, according to Los Angeles Times.